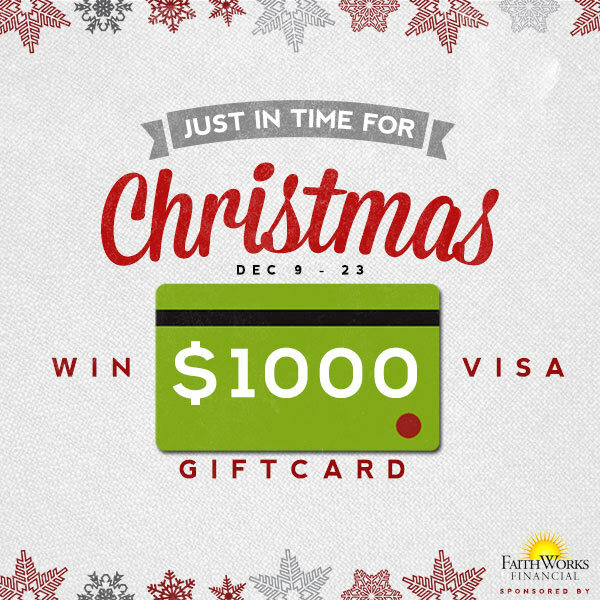 Just in time for Christmas we are excited to announce a $1000 Visa gift card giveaway! We know there is a lot of financial pressure that seems to be applied during and around Christmas time and so a bunch of fellow Christian bloggers have pulled together to put this giveaway together. We first want to thank the folks over at FaithWorks Financial for making this giveaway possible. Put simply, FaithWorks Financial is a company that helps those who are deep in debt. People who are behind on their credit card payments or have bill collectors calling can be greatly helped by them. If you would like to find out more, you can visit FaithWorks Financial to request a FREE consultation. I’m not sure if I’m entered because I read something about follow the “copter”. I didn’t see anything that made me think I was at the “copter” site. Am I registered for the $1,000 gift card? I think you should be good as long as the number of entries on the top of the graphic are showing up for you. The “Copter” is just referring to the Rafflecopter system that we are using to run and track the entries in the giveaway. Thanks! Pray everyone a safe n bless Christmas. Jesus is the reason for the season! I can use the $1000 to pay some bill! I’m sure everyone else does as well! I could really use the money with our heating fuel so high, and taxes coming up. Also could help others with their needs.. I just was lead to your site. Thank 4 living for the Lord!